The decisions we make today regarding housing, land use, and transportation will shape the future of our community for generations to come. Incorporated in 1852, Oakland is located in the heart of the San Francisco Bay Area. It is a city of vibrant, accessible neighborhoods, and a transportation system enabling efficient and non-polluting mobility. Our planning decisions can build on and reinforce these qualities, increasing accessibility for all members of the Oakland community, supporting regional development goals, and making Oakland an even better place to live. Brooklyn Basin Revitalizing Oakland’s Waterfront - Brooklyn Basin – a much-anticipated, mixed-use waterfront neighborhood – broke ground in March 2014. The project will include 3,100 housing units (including 465 affordable units), 200,000 square feet of commercial space, and 30+ acres of parks and open space with Bay access. Developers Signature Development Group and Zarsion Holdings Group Ltd. will also renovate the 5th Avenue and Clinton Basin marinas, preserve a portion of the historic Ninth Avenue Terminal, and restore wetlands. 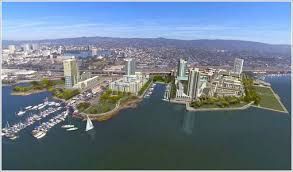 The project will serve as a new link in the San Francisco Bay Trail, provide bike and pedestrian pathways to Lake Merritt, and create an estimated 10,000 short- and long-term jobs. 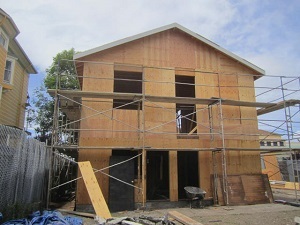 Laney College Partnership Supports Job Training, Brings First “Passive House” to Oakland - In a unique collaboration between the City, Laney College, Oakland Rotary, and Passive House CA, a previously burned, blighted, and abandoned home is being retrofitted to the highest standards of energy efficiency and sustainability. The program is teaching valuable building science skills to Laney students while they remodel the home, reusing as many of the materials on-site as possible. The goal of Passive House design is to create a comfortable indoor environment where the new residents will rarely need to use mechanical heating, and will enjoy improved indoor air quality and a healthy home. City Empowers Low-Income Homeowners While Removing Blight - Oakland’s Residential Lending and Rehab programs are busy helping low-income residents improve their homes and save money on their utility bills. In the 2013-14 Fiscal Year, 52 homes received Minor and Emergency Home Repair services, 36 were rehabilitated through the Home Maintenance and Improvement sub-program, 23 received lead remediation services, and 18 received accessibility modifications. In all, these City programs delivered $709,733 in grants and $1,944,903 in zero- and low-interest loans. Neighborhood Planning Processes Pave the Way for Sustainable Development - The City’s Specific Plan process is a core approach to sustainable development. Specific Plans identify critical policies for land use and development to improve the city’s economy, protect the environment, and enhance the lives of residents. Adopted by City Council in June 2014, the Broadway-Valdez District Specific Plan promotes destination retail and mixed-use development along Broadway between Grand Avenue and Interstate 580. The West Oakland Specific Plan, adopted in July 2014, includes strategies to facilitate development of vacant and underutilized properties, protect and develop mixed-income housing, invest in infrastructure, and support commercial and industrial enterprises. The Lake Merritt BART Station Area Plan and the Coliseum Area Specific Plan are in progress, and are expected to be adopted in late 2014. Commercial Corridor Design Guidelines Now in Effect - Adopted by the Planning Commission in July 2014, the Commercial Corridor Design Guidelines are part of an ongoing effort to transform Oakland’s major transit corridors into attractive, mixed-use activity centers. These corridors include major streets with heavy transit activity such as Telegraph, College, San Pablo, and Bancroft Avenues, and International Boulevard. Policies aim to encourage transit use and revitalize retail activity. The Guidelines provide specific recommendations on how new development along these corridors can be designed in a way that is consistent with City goals, including sustainability, livability, and economic prosperity. Complete Streets Tool Drives Projects - Following City Council adoption of a Complete Streets Policy in 2012-13, the Oakland Transportation Planning and Funding Division developed a “Complete Streets Tool” to track and prioritize transportation projects for grant funding readiness. In FY 13-14, this tool assisted the City in securing over $25 million in grant funding for transportation-related projects. 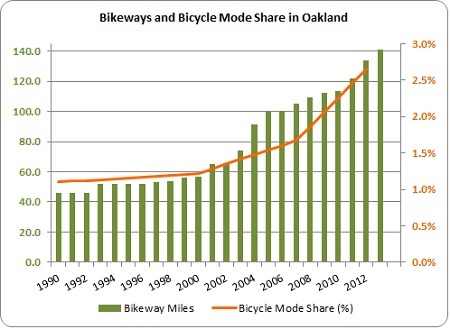 Bikeway Improvements Shift into High Gear - Oakland saw a net gain of seven new bikeway miles in 2013 that expanded & improved the network, including Shattuck to the Berkeley border, Piedmont Ave., Harrison St., and Oakland Ave. to the Piedmont border, and elimination of gaps on Foothill Blvd. In December 2013, the City installed its first buffered bike lanes on portions of MacArthur Blvd. and Harrison St., to provide greater separation between cyclists and vehicles. In another important milestone, in September 2013, the 2.2-mile Alex Zuckerman Bicycle/Pedestrian Path opened as part of the new Eastern Span of the San Francisco‐Oakland Bay Bridge. The path is 15.5 feet wide and delineated for two‐way bicycle travel with separate space for walking. In addition to the path on the bridge, an additional 2.7 miles of paths provide access to the bridge touchdown. 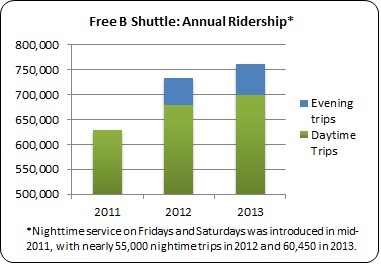 Free B Shuttle Continues to Expand - Passengers took more than 760,000 trips on the downtown Free B Shuttle in 2013, reducing vehicle miles traveled by 3.3 million and reducing auto emissions by 4 tons. View routes, schedules and more information, and hop on the Free B! MacArthur Station Development Coming Soon - A new transit-oriented development, MacArthur Station is the result of a community effort known as the BART Citizens’ Planning Committee. The 7.8-acre project will provide 624 new homes, including 108 affordable units, in five buildings; a 6-story parking garage; commercial and retail space; and community areas. The parking structure and a portion of the homes are expected to be complete by May 2015. Bikeshare Extended to Oakland - Announced in April 2014, the Metropolitan Transit Commission (MTC) is devoting $8.7 million to extend the popular Bay Area Bikeshare program to Oakland, Emeryville, and Berkeley. 750 bikes are expected to be distributed to the three cities. The MTC is working with local jurisdictions, transit authorities, and others to select station locations. “One Bay Area” Grant to Improve Bike and Pedestrian Access in Priority Development Areas - In the first round of One Bay Area funding, Oakland received over $27 million in MTC and committed matching funds. Funding will go to Priority Development Areas: Eastmont Transit Village, and the Lake Merritt, Fruitvale, Coliseum, MacArthur, West Oakland, and 12th and 19th St. BART stations. Projects will include pavement rehabilitation, low-impact development, and bikeways. Bus Rapid Transit Advancing - The AC Transit Eastbay Bus Rapid Transit (BRT), a high-capacity rapid transit system that will run 9.5 miles from Uptown Oakland to the San Leandro BART Station, is fully funded, including $28 million for streetscape/infrastructure improvements and business development support for merchants along the route. Service will run every five minutes during peak hours, and vehicles will be powered by hybrid electric or clean diesel. New Bike Racks Coming to Oakland - A grant from the Transportation Fund for Clean Air and the Alameda County Transportation Commission is enabling the City to install approximately 250 bike racks in the public right-of-way (mostly sidewalks) between January 2014 and December 2015. Click here for program information, and to request a location to be evaluated, please visit www.oaklandbikes.info/cityracks. Portions of East Bay Greenway in Final Design Phase - Six miles of the planned East Bay Greenway are located in Oakland. The multi-use pathway will run from East 12th Street at 18th Avenue, to 105th Avenue at San Leandro Boulevard, and will travel along, above, and under three BART Stations. The segment linking the Coliseum BART station to 85th Avenue along San Leandro Boulevard is funded and under construction. Regional agencies have applied for additional funding to complete the other segments, including portions that require purchasing right-of-way from Union Pacific Railroad. Members of the public are welcome to attend meetings of the City Council, Council Committees, Planning Commission, transit agencies, and neighborhood groups, and to participate in events such as Bike to Work Day.